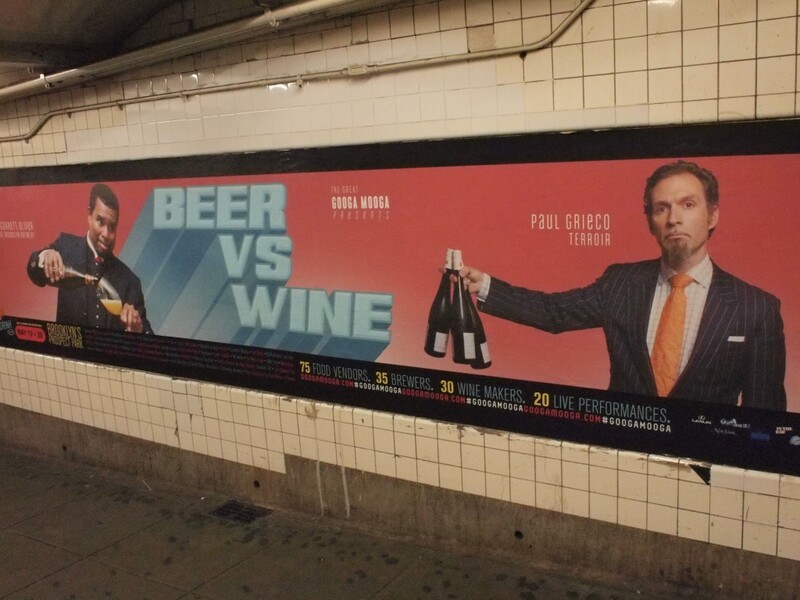 The guy on the right of this poster in the New York subway is Paul Grieco, the dynamo of the Global Riesling Somm-Sation. He just won the James Beard Award for the Outstanding Wine & Spirits Professional of 2012. CONGRATULATIONS PAUL They finally realized that they need you! To celebrate German wine and this great success on Thursday, May 10th Paul Grieco, Roy Metzdorf of the Weinstein wine bar in Berlin, nearly a hundred Riesling fans and I celebrated the Long Night of German Wine NYC at Grieco’s Hearth Restaurant (403 East 12th Street, at First Avenue). We not only had a dangerously good time together, we also raised around $6,300 for “Wein hilft”, or wine helps. 100% of those donations will go to the HIV / AIDS foundation HOPE in Cape Town / South Africa. The high point of a very long night was the auctioning of a bottle of 1983 Wehlener Sonnenuhr Riesling Eiswein from Joh. Jos. Prüm in the Mosel from my private cellar for $1,350. Thank you to the Hearth team for making this possible! „What is Riesling?“ The question seems too simple to need posing, the answer too obvious to need giving. But this is actually like one of those kid’s questions such as „why is the sky blue?“ which are incredibly hard to answer. You see, the reply that Riesling is the 20th most widely-planted of the 10,000 grape varieties on Planet Wine and that the white wines made from it have a vibrant personality is only the beginning of a proper answer. During the last years a big change happened and Riesling also became a global network linking wine drinkers with winemakers and the people selling the wines in all kinds of situations. 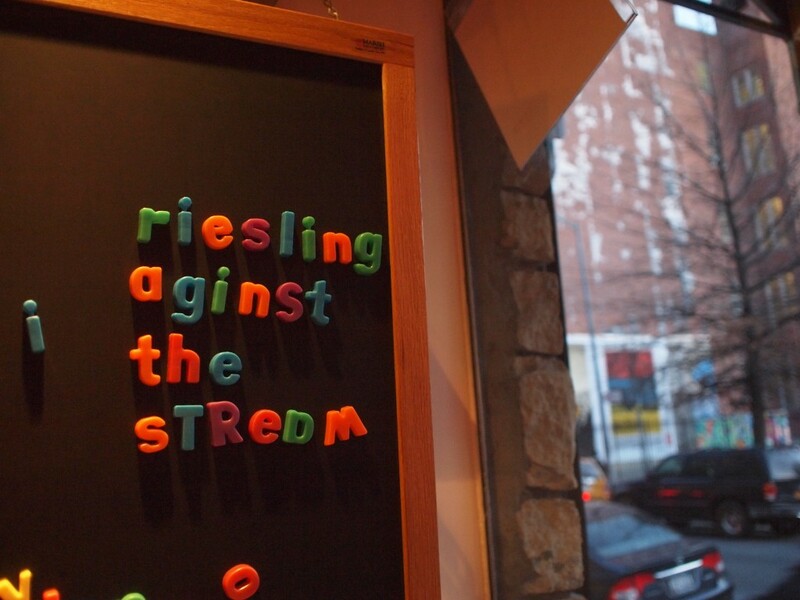 Most importantly Riesling is a rapidly growing Global Somm-Sation, that is a wine which sommeliers in restaurants right around Planet Wine love, rave and obsess about. The only other grape that’s the object of a similar cult is (the red) Pinot Noir. Sadly, some wine drinkers still make the mistake of thinking all Rieslings are sweet, and the fear of sweetness keeps many imprisoned within their comfort-zone of „dry“ wines (which often turn out to actually be slightly sweet). Many people still associate sweetness with inferior, outdated wines ill-suited to the dining table and fail to realize that the sweetness in some Riesling wines is natural, coming directly from the grape. Then they put spoonfuls of sugar in their coffee or drink a cola! Other wine drinkers who like sweet wines frequently feel embarrassed, fearing they will be taken for schmucks if they admit what their taste in wine is. America is far from being the only place where people are schizophrenic about sweetness! Thinking and drinking only inside that box has convinced some that Riesling is a pussycat amongst wines. The somms laugh about this and think of the words of California winemaker and free-thinker Randall Grahm, „I am Riesling, a lioness, the queen of the jungle. Hear me roar!“ They also know that most people find sweet Rieslings work really well with spicy food, be it Tex-Mex or Thai, when they try it. More recently some wine drinkers have been jumping in the opposite direction by claiming that „real“ Riesling must always be dry. Usually this spiel is just a way to stand out from the crowd and look sophisticated. In fact, Riesling can be dry or sweet and comes in every gradation from bone-dry to honey-sweet; the first dimension in this cosmos of flavor. It means that unless you only drink heavy reds you’re almost sure to find some Rieslings to love. Thousands of people who said they wouldn’t later admitted that they had. The way Riesling wines range from feather-lightness to black hole density, yet always remain refreshing and energizing, is the second dimension of Riesling flavor. The wines from certain other fashionable grapes can pack a bigger punch up front, but they frequently become tiring the more you drink of them, whereas Riesling grows on you with each sip, gently tugging you back to the glass again and again until you suddenly realize…Oh no! That bottle’s empty. One reason for this is the absence of wood aromas and flavors from aging in small oak barrels in Riesling wines. Good Riesling is a read-my-lips-wine. What you taste comes only from the grapes and the yeast which transformed them into wine. Oak aromas and flavors from barrels may be traditional for some other wine types, but it is most definitely a non-grape character, which makes them taste heavier. The somms rave about Riesling’s purity for this reason, pointing out how there’s so much aroma and freshness packed in ripe Riesling grapes that the winemaker has no need to add anything to it. If the winemaker did try and stamp his will on a Riesling, then he’d disrupt the delicate balancing act between ripeness and freshness in the wine. Riesling-wines are even more diverse than this suggests though, because the smallest distance from one vineyard to the next lead to pronounced differences in the flavor of the wines from them. Riesling is all about location, location, location rather than what high-tech enables winemakers to do in the cellar. The somms call this transparency, which you could translate as “honesty”. To get this third dimension of my favorite grape you’re going to have to put your nose way into the glass and inhale deeply, then savor the Riesling as it rolls slowly over your palate like a big wave in Maui. All of this became clear to me back in the 1980s when exciting Riesling wines were few and far between; rare moments of illumination in a gloomy wine world. But, to be frank, back then Bordeaux and Napa weren’t achieving much higher strike-rates with their high-end reds. Looking back to that wine time feels like studying a distant geological epoch to me, so utterly has the situation changed since. And for no other white wine has it changed as radically as for German-speaking Riesling. Some people have told me that this change is all down to me, because I spent the last 30 years writing about it, but that’s ridiculous, because I’m just one journalist, against hundreds of new winegrowers in Germany, Austria and beyond who created what the American press a decade ago christened the Riesling Renaissance. I also heard that I coined the phrase Generation Riesling for the “Jungwinzer” or young winegrowers of Germany who also started making a splash in their home country about a decade ago. That’s not true either. I was just repeating something I’d heard, though I have to admit it was a darned good quote. However, I have to admit that I did once say Rocky Horror Riesling Show. I was describing an ugly and cloyingly sweet American Riesling I tasted blind when helping to judge the Orange National Show in San Bernadino/California, the birthplace of the Big Mac. That was back in spring 1989 in though, during what I call the Long Night of American Riesling. The fact that the story of the grape’s revival in the US and Canada since then hasn’t been told properly, is the result of its gradual progress from the release of Randall Grahm’s groundbreaking ‘Pacific Rim’ in California in 1992, through the launch of Chateau Ste. Michelle & Dr. Loosen joint-venture ‘Eroica’ in Washington State back in 2000 and on to Paul Grieco’s first Summer of Riesling festival at his Terroir wine bar in New York City in 2008. Now the United States of Riesling are on a roll and the media are beginning to ask themselves how they didn’t see that coming.